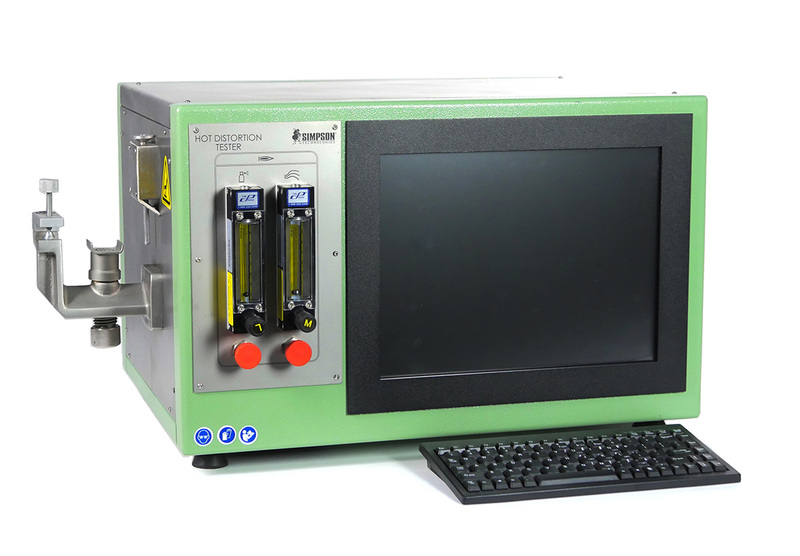 The Hot Distortion Tester measures the expansion and high temperature plastic performance of chemically bonded sands when suddenly heated by liquid metal. Items can be emailed to you or submitted for a personalized quote. When a mold or a core is suddenly heated by contacting a liquid metal, it distorts. This distortion may cause casting quality problems such as veining, broken molds or cores, mold wall movement and difficulties maintaining critical dimensions. Therefore, it is important to know the performance of these materials during heating. From the hot distortion curve, valuable conclusions may be determined. Readings from the curve can be used to provide an indication of the thermal expansion, hot brittleness, burn out rate and thermo-plasticity. The time required to break the specimen is an indication of the binder’s hot strength. The deformation is measured during the entire test and is shown on a color monitor. The distortion curve can be printed or stored in the internal memory of the machine and data can be downloaded into Microsoft® Excel for further statistical evaluation. The instrument also has the capability to accept user defined process control curves entered from the keyboard. The test specimen, AFS (American Foundry Society) sand testing standard of 1 x 1/4 x 4-1/2 inches or the metric specimen from the Metric Sand Testing Standard of 115mm x 25mm x 6mm must be prepared by blowing under steady conditions so as to secure dimensional accuracy and compaction grade with no variation.